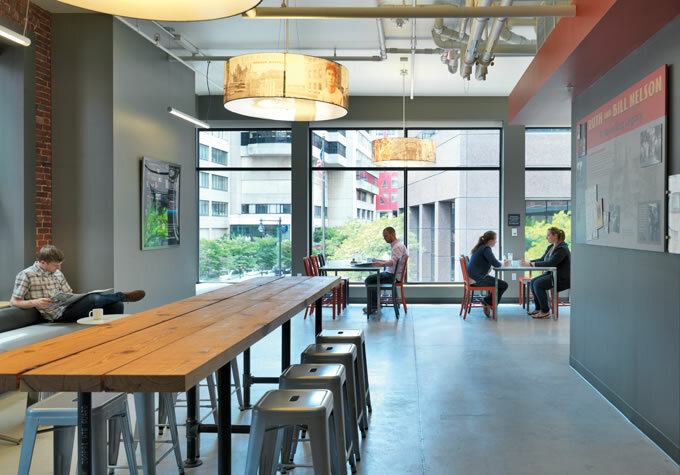 Hostelling International chose a historic building on the edge of Boston’s Theater District for its street-level storefronts and spacious floors. Working alongside Stegman Associates (Associate Architects), Bergmeyer developed the multifaceted program, which guided space planning and informed the selection of furniture and finishes. Capitalizing on the innate efficiency of hostel accommodations and building on adaptive reuse as a strategy, the team designed a hostel that earned LEED Silver certification. Sustainable and energy efficient features include high-performance space heating and cooling systems, building envelope enhancements, high recycled-content furniture and finishes, bicycle storage, reduced lighting power density, and regionally-sourced recycled building materials. Rather than specify photovoltaic panels, the design incorporates solar thermal panels to optimize hot water heating, a significant portion of HI’s energy consumption. Signage and QR codes encourage travelers to learn more about the building’s integrated sustainable strategy.